I have set aside a month and a half of my empty summer home from school to work on an idea that had seeded in me since middle school. Now it has evolved into a full fledged medieval sandbox style RPG. This is the first time I have put ANY of its information out in the public. This game's plot wants to redefine what can constitute a plot for a major series. It features two "main plots", each with a level of groundbreaking storytelling little seen. It is set in a world, Junes, created out the eternal struggle of three gods, on the continent of Arenti, and the country of Aequalo. Aequalo is Arenti's northernmost, third largest and most populous (out of 12) but is the economic and political superpower of the continent. The Aequalan Empire championed a progressive international policy, declaring peace for all 12 countries after 1000 years of violence. Nothing can break Arenti's solid presence of peace. Except for one man. That man is Numen Aureus, and with his cult, Purity of Life, he alone wishes to become the True Fourth God by changing the way people die. Fourth God? Change the way people die? Let me explain: Junes was created from 3 gods. But they stayed on Junes, fighting, with a resolution indefinite. They were banished from Junes by this mysterious life form they created: Roya the Balancer. The Balancer was mortal who possesses an ability unlike no other: She made the first soul. Souls are animate beings on Junes who occupy their mortal hosts and give them life. After she banished the Three Gods, she led every soul to The Beyond where they can die peacefully. Roya remained on Junes semi-mortal to help protect the souls and prevent the Godly battle from returning. This is where Numen comes in. Numen Aureus, with the help of his cult, wants to replace the Balancer. Why? So he tip the Natural Balance in favor for his favored God of Life, Elsivir, can win the eternal struggle and eliminate the soul from the mortal completely. In this, be believes he can eternally keep life prosperous, healthy, and pure. Unfortunately, his cult nearly succeeds and nearly kills Roya, causing the souls to panic when people die, leaving the souls no where to go. They stay in their dead mortal hosts. They become Soulstruck. The entire plant of Junes is in chaos and no one can permanently kill people. It is up to Roya's Soul Champion to stop Numen and Restore the Nature Order of Things. Amidst this crisis, another one plagues Aequalo's very economic structure: The Red Gold War. Aequalo, yes, is prosperous, but the wealth is only reserved for the top races while other inferior races are forced to live underground by law, making objects for a society that artificially creates value for creations, and another inferior race reduced to slavery. Aequalo's fifteen counties seem to be very wealty, but only a select few. Only the capital county and those surrounding it. The others are large and poor, since Aequalo is cold and inhospitable in large places. They are unfairly represented in government and recieve little to no help for anything, forcing them to turn other more illicit sources of income: the Black Market for Gold. Aequalo currently has a law that states that all gold mined in the country is the property of the government. Any person or organization who claims ownership outside government control is considered illicit. Well, the government only hires one contractor for mining: The Golden Touch Mining Corporation. All others are members of the black market. Well, one organization has taken advantage of this and cleverly named themselves: The Black Gold Alliance: People who believe that the gold trade should not be restricted to the government. How do they stay in power? They fund various county governments where the federal government won't. How does racism take part? The Black Gold Alliance is run by the very race that is forced to live underground, who live in the mountains right by the gold mines. They also want to push for the abolition of slavery in the gold trade, which is an extremely radical idea. That is bad: what to do with the freed slaves? Their race assures them a permanent place at the rut of society? What else could they do? Where the Soul Champion comes in, well, the Soul Champion can take the side of either the government or the Black Gold Alliance and cause a social revolution, denying or allowing the gold trade to the government or public. Here is a map of Aequalo. Sorry if the text is too small. It was a huge photo I was working from. Some of the county and capital names have since changed. Think of the length as the same as from mid-Minnesota to the southern edge of Louisiana. Think of the width as the eastern edge of upstate New York to the western edge of Iowa. Yeah. Aequalo is cold, but not as cool as it could be. It is mountainous and its northernmost county is an arctic wasteland, and Siberia-like forest. But everywhere else it is at least somewhat habitable. 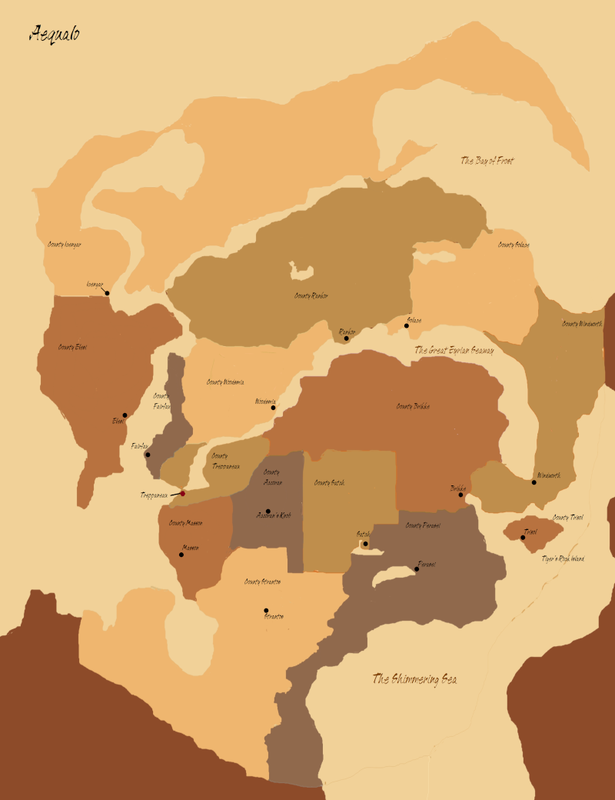 County Yunis (Brikke on this map) and Windworth are essentially all mountains isolating County Ellinor (Solace on the map). County Treppaneau is the capital County. The most prosperous county in the country featuring its capital, Treppaneau. The counties to the south feature a very temperate climate of grasslands featuring great farmlands except for County Satch which is the site of a nasty desert. Counties Woodsmia and Fairfax are densely forested and are also very prosperous. County Eyrmoth (Elesi on the map) is an odd one: sitting on a sea it is warmed and thus densely forested but yet it is isolated, thus producing several radical religious groups. Any opinions, suggestions, or ideas? It all sounds very intriguing. My only critique would be the sheer number of A-starting names in the first two posts makes it seem like you opened a name dictionary and didn't even get past the first page. It might be a coincidence, but still. Aureus, Arenti, Aequalo, Aequalan....yeah I see. They do start to run together...The whole presence of A-names is a coincidence. I made these names up. I might consider including more variety. Aequalo is the only country on Arenti that begins with an A.
Dragon78114 wrote: Aureus, Arenti, Aequalo, Aequalan....yeah I see. They do start to run together...The whole presence of A-names is a coincidence. I made these names up. I might consider including more variety. Aequalo is the only country on Arenti that begins with an A.
I guess it's a coincidence that your previous questline is also full of As - Azzan and Axar. I think someone just likes the letter A.